New Delhi, Mar 8 : Ulfa and the Centre today hinted they are nudging towards a settlement rooted in "Assam's identity" for which the government might amend the Constitution. A seven-member Ulfa delegation led by Arabinda Rajkhowa today met home minister Sushil Kumar Shinde after an hourlong meeting with Union home secretary R.K. Singh and interlocutor P.C Haldar. Singh said a lot of "core concerns" were discussed in the meeting. However, no one from the Assam government participated in the "tripartite" talks. "Whatever will be worked out will come out of the core issue of identity…It is about preserving the identity of Assam," said senior Ulfa leader Sashadhar Choudhury. Choudhury said the government appeared to be "in the mood and position" that a settlement would be worked out soon. Besides Rajkhowa and Choudhury, Raju Barua, Pradip Gogoi, Mithinga Daimary, Pranati Deka and Chitrabon Hazarika attended the meeting. The talks were held at North Block, where chief minister Tarun Gogoi is tackling dissidence within his government, chiefly from young Turk Himanta Biswa Sarma. The talks were termed positive and a lot of ground was covered, Singh added later. His sentiment was echoed by the Ulfa leaders who sent out positive signals. On Ulfa leader Paresh Barua's reported comment that the current lot of Ulfa is "ex-Ulfa", Rajkhowa shot back: "Those are his personal views". The home secretary also did not deny that the government is ready to amend the Constitution to grant safeguards for the "identity" of people in Assam. Ulfa has been pressing for Scheduled Tribe status for some tribes like the Morans and Muttocks of Upper Assam, to which both Paresh Barua and Anup Chetia belong. The negotiation also includes issues that could lead to safeguarding of "indigenous" communities. The question of expansion of the Ulfa team, with the inclusion of Chetia, also came up during the discussions. Chetia is currently lodged in a Bangladesh jail and his petition ' seeking asylum in that country ' is pending in court. Choudhury, however, said Chetia has to be extradited as the "situation in Bangladesh is not good". Bangladesh is headed for elections by December this year. 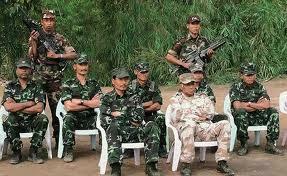 Ulfa hopes and the government wants to extradite Chetia before that. The Awami League-led government has been a consistent facilitator in resolving India's militancy problem in the Northeast.